Your body takes a beating during a competition, and you may have already been pushing your limits during training. We at Archer Physical Therapy understand what it takes to be an endurance athlete, and we will be there to help you during the race and after on Raccoon Mountain. The Archer Recovery Acceleration Program was developed by Debra Martin, MSPT, CLT to provide you with the top quality care you need at local events. Stop by our first aid station & learn more about making sure you have the right amount of fluids after the event. You can also receive a therapeutic massage, or information on when to contact your doctor about an injury. We also have a wide variety of ways to prevent and treat blisters, as well as cleansing and covering wounds. Feel free to ask questions about any aches & pains & what is the best next step to take to get back on track. We want to use our knowledge & skills to speed your recovery so that you will stay healthy & continue to press on towards your goals! Even if you think you just have a small pain, bruise or cut, stop by & take advantage of the free health care available for you at the race. A few moments of aid can prevent weeks of problems down the road. Plan to carry these items with you during the race. Having your medication in your car won’t be nearly as helpful as having it at hand when you need it on the trail! Which of the following shoes are the best choice to wear on race day? Of the choices above, “3” – New trail shoes – are the best! Or, if your current trail shoes have over 400-500 miles on them, it’s time to make the switch to a new pair. More tips on hydration, warm weather running & information on how trail shoes differ from road shoes can be found through the Run Fit page on the Archer PT web site: www.archerpt.com. Also check out Rock/Creek’s Trail Running Gear Guide. You can find portable first aid supplies, bags to carry them as you run, and a wide variety of trail running shoes at Rock/Creek. 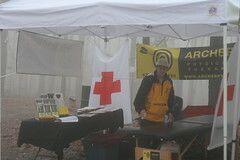 Archer Physical Therapy offers unique assistance at many events in the TN & GA area through the Event Medical Coverage & Recovery Acceleration Program, developed by Debra Martin, MSPT, CLT. Debra has combined her 15 years of experience in treating wounds & athletic injuries throughout the rehabilitation process with cutting-edge research on medical care to meet the needs of endurance and adventure-sports athletes. In fact, she’s probably thinking of ways to get you better even faster while you are reading this – she’s just that cool. She also set the record for the flexed arm hang test at Leda Shishoff Elementary School at a little over 2 min., & perhaps would still be there if the gym teacher had not made her come down.